The administration is changing the rules for migrants at the border, despite Democrat opposition, President Donald Trump told the Associated Press. “We should be getting credit for the job we’ve done,” Trump told the Associated Press. Trump’s remarks come as his deputies have begun pressuring the Mexican government to stop the transit of another “caravan” of job-seeking migrants through Mexico to the U.S. border. 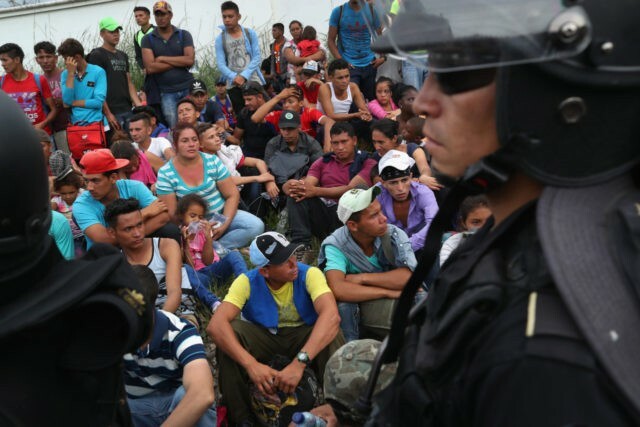 Officials say they need the Mexican government to act because Democrats have blocked draft federal laws that could turn away the migrant job-seekers before they can flood into the labor market and force down Americans’ wages. The changed rules that Trump cited in the Associated Press interview are likely the stream of policies and regulations emerging from Attorney Gen. Jeff Sessions’ office, and from Secretary Kirstjen Nielsen’s Department of Homeland Security. For example, Sessions persuaded the Supreme Court to accept Trump’s authority to decide immigration by Muslims or other groups. Sessions has gotten a hostile Californian judge to agree that migrants can be detained with their child or children for 20 days. Trump’s aides are now considering using the 20-day rule in a new border policy which tells migrant men or women that they will be detained with their child or children for 20 days, but then must decide whether they want to go home or have their child sent to a shelter while the parents remain detained until their court cases are completed, in as little as 40 days. Sessions has ordered his agency’s immigration-court judges to discard the pro-migration rules set by former President Barack Obama. From 2010, Obama triggered the migration wave by offering easy asylum to migrants — including those who say they are threatened by spouses and criminal gangs — and by using federal agencies to deliver cartel-smuggled children and youths from the border to their parents living illegally in the United States. 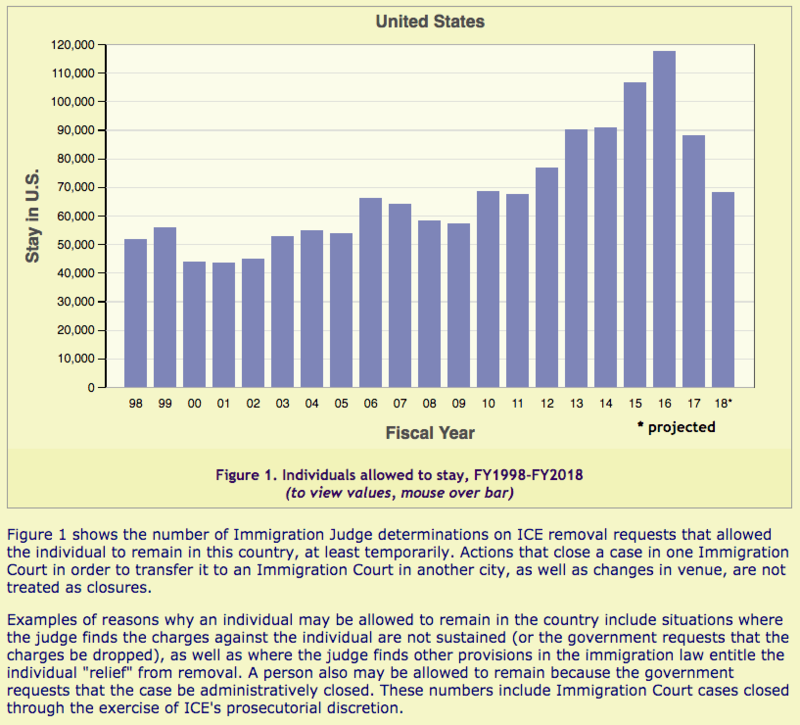 Sessions has also hired more judges, sped up the judicial process, and has almost halved the percentage of job-seeking migrants who are being allowed to stay in the United States. Democrats have made “child separation” into an emotional issue for their supporters, even though the use of children is now a huge part of the cartels’ business. The cartels’ coyotes are telling their job-seeking migrant clients to bring their children to the border. The migrants’ children are useful because they trigger the 2015 Flores catch-and-release loophole, so allowing the migrants to get through the border, get a job, and pay their smuggling debts to the cartels. You don’t prioritize by going after and deporting people who are working hard, who are paying their taxes, who are active in their church, who are raising their families, who are doing things in our community … Why would we deport them? Similarly, the AP suggested Trump was responsible for the cartels’ use of children as a smuggling tool. Trump rejected the AP’s attempt to guilt him for the cartels’ business strategy. Here’s the thing. I think we’ve done an incredible job with children. As I just said, we’ve taken children who have no parents with them standing on the border. We’ve taken many children, and I’m not talking about a small percentage, I’m talking about a very large percentage where they have no people, no parents. In addition to that, we’re separating children who are just met by people that are using them [for] coming into the border. The one thing I will also say is that when a person thinks they will not be separated, our border becomes overrun with people coming in. So that’s another problem. With all of that being said, we’re getting the laws changed so that catch and release, so that visa lottery, so that chain migration and every other form of incredible stupidity can be taken out of our system. I’ll send you guys the DHS report that has the numbers that show that, like, 75 percent of the kids were actually self-separated. Their parents chose to go back and signed the paperwork to leave their kids behind. But the alternative “priority or fairness” polls — plus the 2016 election — show that voters in the polling booth put a much higher priority on helping their families, neighbors, and fellow nationals get decent jobs in a high-tech, high-immigration, low-wage economy.